DETROIT — After 10 million vehicles over 54 years, the Mustang remains one of the most vital nameplates in Ford Motor Co.'s stable. It's Exhibit A for what the Ford brand wants to stand for: bold, emotional designs that elicit passion among its customers. The rest of its cars lack that cachet, which is why, after the Fusion sedan disappears from showrooms early next decade, the Mustang effectively will be Ford's last car standing as the brand shifts to a lineup dominated by pickups and utility vehicles. Now, Ford is trying to re-create that Mustang magic in its crossover and SUV lineup. One vehicle in particular, a yet-to-be-named battery-electric crossover, was heavily inspired by the Mustang; Ford floated the name Mach 1 for it this year, though the production version is likely to get a different moniker. "It's core to what people see Ford as," Carl Widmann, the Mustang's chief engineer, told Automotive News. "We wanted a vehicle that would draw people to the showroom floor. There's clear evidence that's the case." The Mustang has been the best-selling sports coupe in the U.S. since its redesign in 2014. Ford began selling the Mustang globally in 2015 and now sells it in more than 140 markets, including China, Germany and Australia. 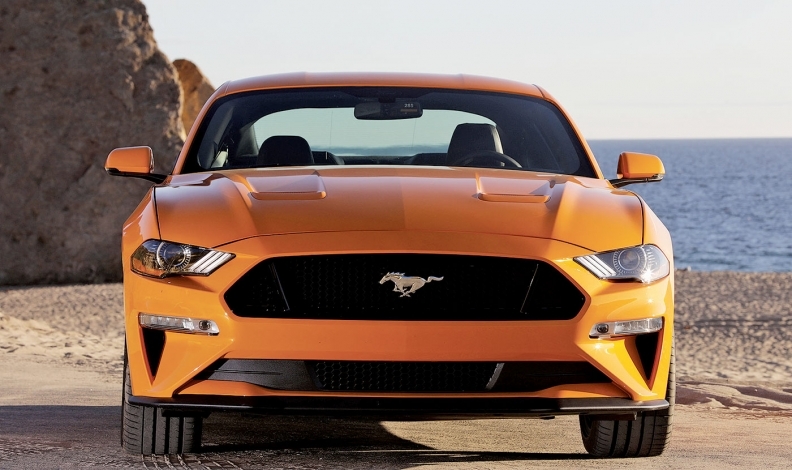 Despite the Mustang's importance to the company, CEO Jim Hackett reportedly pushed back the seventh-generation program by about a year. A redesigned Mustang now is expected in 2021. The car rides on an exclusive rear-wheel-drive platform but could move to one of the company's five new modular architectures, presumably the rwd/all-wheel-drive unibody underpinnings it would share with utilities such as the Explorer and Lincoln Aviator. That would give Ford the option of building an awd pony car for better handling in winter and to compete with the awd version of the Dodge Challenger that launched in 2017. The company also plans the first Mustang hybrid, set to arrive in 2020. Members of the Mustang team were mum on details about the next-generation car but said the move to a modular architecture won't hurt their design creativity. "Mustang is still going to be a strong, well proportioned vehicle," the Mustang's chief designer, Darrell Behmer, said. "The modular architectures will still give us flexibility; it's not going to bastardize Mustang." Widmann said the move won't fundamentally change the car. "The general layout of rwd has morphed over time, but it's still the general architecture that it has been," he said. "In the architecture world of a rwd — which you're going to end up with a rwd architecture — I think these pieces of it are pieces that will always work. As you tune it and put a top hat on it, you can get different combinations and can define a lot of the emotion." The current-generation Mustang resonates so well, Widmann said, because of its styling, diverse powertrains and driveability on or off a racetrack. The team worked to give the 2015 model a more aggressive look while keeping traditional design elements. The vehicle's footprint was unchanged, but the roof and hood were lowered about three centimetres (1.2 inches). Visibility also was key, Widmann said, as the team tried to maintain the previous generation's proportions. "It's critical to always have the ability to keep theme elements but not be stuck in a rut," Widmann said. "It's a balance of not being caught in the past but still moving forward, which is a tremendous trick." Ford has made incremental improvements since the 2015 redesign, adding a 10-speed automatic transmission and dropping the V-6 engine in 2018. It also has reintroduced special editions, including the Bullitt and California Special, and revived performance variants such as the Shelby GT350 and Cobra Jet. Although U.S. sales are down 4.8 per cent this year to 48,362 through July, the car is outselling its chief rivals: the Challenger and Chevrolet Camaro. In Canada, sales are down less than half a per cent to 6,249 units. It's outselling the Challenger and Camaro by more than three to one. "It's the heart and soul of Ford," Jim Farley, Ford's president of global markets, said at a celebration this month of the 10 millionth Mustang produced. "It's one of the reasons why we're different and it continues to inspire other vehicles in the lineup." The Mustang-inspired electric crossover, due in 2020, likely will borrow heavily from the pony car's front-end design and combine the performance of an EV with the utility of an Explorer-like crossover. Just don't expect it to be called Mach 1, a name Ford used for a Mustang performance option at various times from 1968 through the 2004 model year. "We put that out there to evaluate it," Farley said of the name. "There are pros and cons. I don't want to handicap it at this point, but we got a very strong reaction from people." After Ford released a teaser video for the vehicle this year, one YouTube user responded: "If they end up calling an SUV a Mach 1, I will never buy a Ford car or truck as long as I live. Blasphemy!" Another added: "As a man who owns a 2003 mach 1 5-Speed, I am DISGUSTED. The mach 1 is the most iconic stang and you're disgracing its name with this. Shame." Regardless of what name Ford picks, people who have helped shape the Mustang are excited by the prospect of expanding its DNA to other vehicles. "Mustang has a soul. It's a balance of performance and design," Behmer said. "If you can capitalize on the cachet and let that rub off on the rest of the portfolio, it's a good thing."